Home Thoughts Opinions A Rare Map of Martin Waldseemuller Pops Up At Munich University Library! A Rare Map of Martin Waldseemuller Pops Up At Munich University Library! Recently, a bibliographer performed some common duties, revising catalogs at the Munich University Library. 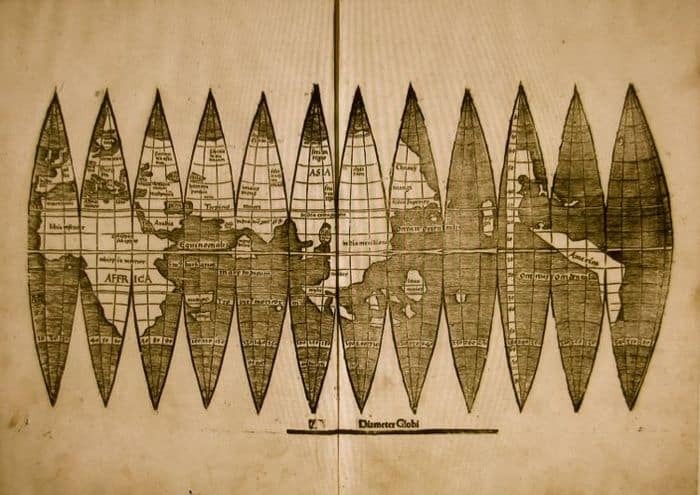 When thumbing through an inconspicuous volume, the bibliographer stumbled upon a map print amongst works on geometry, dating from the 16th century. Now it’s been verified, the unusual cut-out map is a fifth copy of the break-through map by German cartographer Martin Waldseemueller. One hundred smaller versions of the master map, which gave the newly discovered continent the name of America (after New World discoverer, Amerigo Vespucci), helped in disseminating a crude knowledge of world geography. Only five of these original prints (made from wood block printing), made by Martin Waldseemuller himself, are still in existence (unless others are discovered in the future) today. Therefore, the new find is very significant! In 2005 one of these map prints fetched one million dollars at a Christie’s auction, so this tells you how valuable the find truly is. I looked for an explanation for how scholars were able to verify the document came from the hand of the most famous German cartographer, but nothing has been published yet. As for the provenance of the pristine print, this is equally muddled in confusion. I’ll point you in the right direction, with an article published in Science Daily, Rare Map related to America’s ‘Birth Certificate’ Discovered in Munich University Library. You might ask, what was an important document doing stuck down in an old musty, obscure book? That is a mystery that may not ever be answered. I will say, however, a wise librarian from the WWII era, thought to move the book (which was placed in deposit box No. 340), to a safe locale, in lieu of the massive bombing efforts of the Allies. The Science Daily article does point out, the map likely was part of the original collection in the library associated with the University of Munich. A Renaissance man, Swiss humanist and polymath Heinrich Loriti Glareanus (1488-1563), accumulated a good deal of early printed books, which in turn were acquired by Johann Egolph von Knoringen (1537-1575). Knoringen’s collection of more than 6,000 volumes is the core basis for the University of Munich’s library collection. So there’s some provenance here. I suspect this rare fold out print has been there all along since Waldseemueller’s day, who died in 1522. I wanted to take a good look at the map for myself. You can find a clear PDF scan in a piece in the Global Post, so I’ll link it for you at the end, so you can take a look at it for yourself. It looks like a cartoon cut-out, and apparently was intended to be glued onto a globe as a geography tool for students (or possibly for scholars too). You won’t recognize the shape of America! Yet, it’s important that Martin was at least struggling with a drawing of our continent. His original map was made in 1507, so this was just 15 years after Columbus discovered America. Yet Martin thought it was Amerigo Vespucci who had made the discovery; later on he realized his error. The name stuck though, and we must be glad it did! Waldseemueller’s master map, a three-square-meter world wall map, resides securely with the Library of Congress now. In 2007, German Chancellor Angela Merkel handed off the larger map to the United States, on the 500th anniversary of its creation of the name of America, along with its misty contours. You never can tell what you’ll come upon when perusing old records. One should be very careful before discarding paper records, especially if they believe everything worthy has already been converted to a digital file. This may explain why crafty collectors roam remote flea markets in search of rarities overlooked by narrow-minded buffoons.